With more than 450,000 students and 90,000 faculty and staff, The State University of New York is quite the organization to govern. This is why the concept of shared governance is critical to the development of policies and in decision making that affects the institution as a whole. 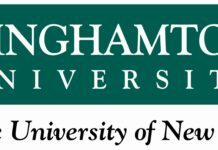 And we Student Assembly of the State University of New York is the official organization by which University students participate in University-wide governance. We are committed to the student experience at SUNY and to being voices of student leadership in New York and all across America. Part of running an organization of this size requires the leadership to get together to discuss their work and plan the future. We recently completed our 2015 SUNY SA Fall Conference, and it was one to remember. Many students commented that this was the best conference in recent memory. Aside from hitting a record 280+ students leaders in attendance, Chancellor Zimpher opened the conference by commending President Thomas Mastro‘s administration on a strong start to the year and a job well done during the first semester. 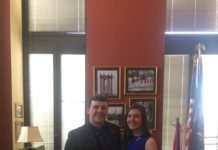 Business activities at the conference ran smoothly and efficiently with Vice President Melissa Kathan, a student at University at Buffalo, and Parliamentarian Jefferson Dedrick, a student at Fredonia, leading the charge. The Assembly passed several resolutions including SUNY SA’s Legislative Agenda, which advocates for causes such as higher standards for unpaid credit-bearing internships, increased funding for child care centers, textbook affordability, and much more. Students were also offered invaluable professional development and leadership sessions that explored a wide variety of topics, which included effective communication, equity and inclusion, advocating at the state and federal levels, and building your own digital brand. The meetings and workshops turned out to be productive and quite helpful to all in attendance. 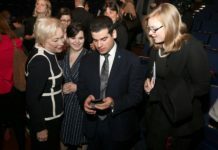 But before they took place, President Thomas Mastro gave his State of the Assembly Address, which was a SUNY SA first and one that was well received. 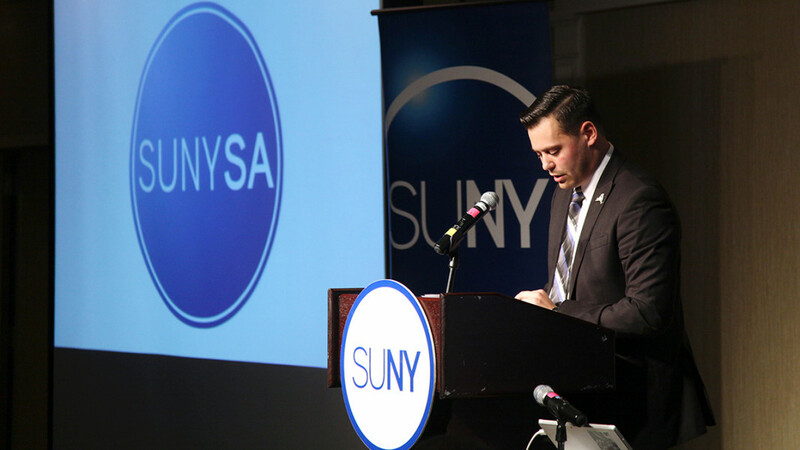 President Mastro spoke about SUNY SA’s new brand identity, officially launching the new logo; a new redesigned website; and our new publication COBALT. These big goals were part of a large effort this year to effectively communicate the message and professionalism of the SA across all digital platforms. An animated SUNY SA video that was developed in an effort to broaden the reach to students and members of the community was also introduced as a way to further share the identity of the organization. We also addressed our efforts in being socially responsible as President Mastro applauded the work of the Sustainability Committee in broadening an understanding of environmental concerns, as well as touching on strategic alignments of working with not only the SUNY System administration, but private colleges in New York State and CUNY to garner knowledge and best practices for running an organization of this kind. Collectively, we allowed the student body to understand what the Executive Committee has been doing, what all members are doing, and what is planned in the coming months. This conference brought to students a renewed perspective about SUNY SA and the work we do in an effort to voice the concerns of the nearly half a million students throughout our system. SUNY is the largest comprehensive university system in the United States, and it is clear that SUNY SA works collectively to make the best even better.